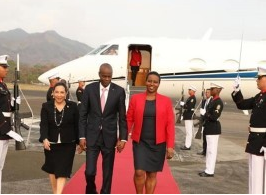 As part of an official visit, President Jovenel Moise left the country on Monday for Panama to participate in the 3rd Edition of the Global Business Forum Latin America – Panamá (GBF2019) in Panama. This two-day forum will focus on the theme “Next Poles – New Regions”. The round tables and workshops organized during the two days of the forum will focus on three main pillars (global reset, regional gateways and new directions) designed to identify common challenges and regional specificities and help delegates to identify and monitor opportunities. Stakeholders include Heads of State, senior officials, Fortune 500 CEOs, along with other leading business and investment leaders from Latin America, the Persian Gulf, and others. The first day of the forum will end with an official networking reception. President Jovenel Moïse will return home on Wednesday, April 10th.